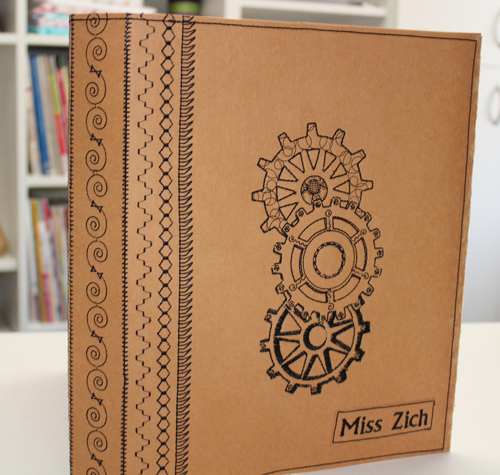 Make this notebook cover for a special teacher or student and send them to school in style. 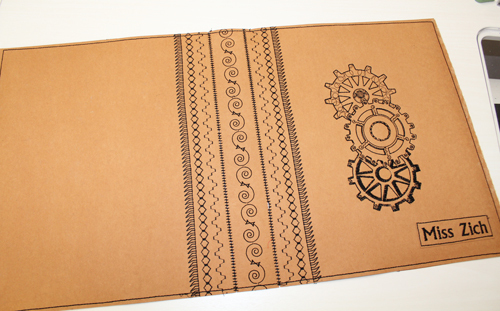 Use your favorite Urban Doodle design and decorative stitches to create a designer-styled cover and pencil case. 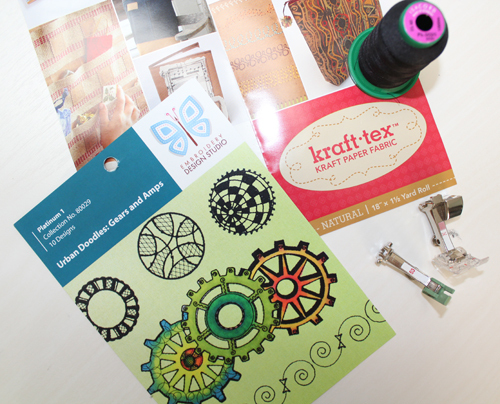 It’s so easy to make using the new kraft•tex™ product from C&T Publications, a rugged paper that feels like leather and sews like fabric. The black embroidery and decorative stitches are a perfect complement to the leather-look cover. Hoop one layer of tear-away stabilizer and spray with 505 adhesive. Center one of the cover pieces on the stabilizer, right side up. 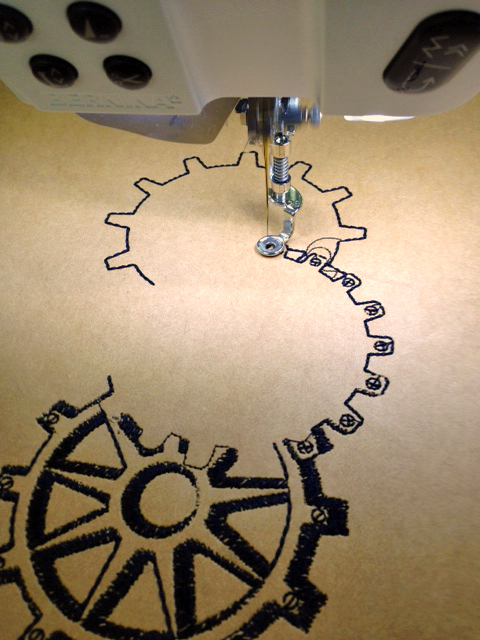 Embroider the gear design in the center using black embroider thread in the needle and bobbin. Tip: You may want to slow the embroidery machine down to half speed. 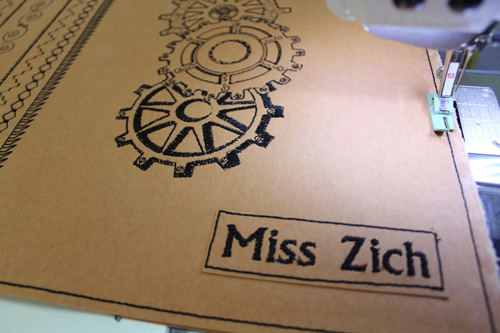 Using the same technique, embroider a name or label using a scrap of kraft•tex™. Trim the embroidered piece around the lettering. Embroider two border designs end-to-end on the spine strip. 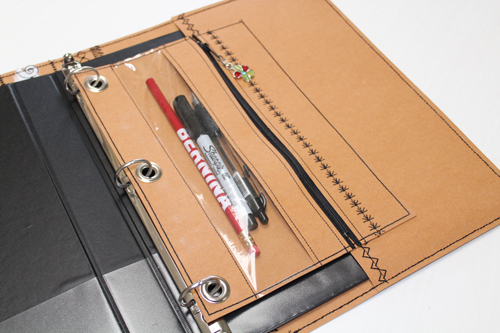 Trim each piece to 1-3/4″ x 13″. 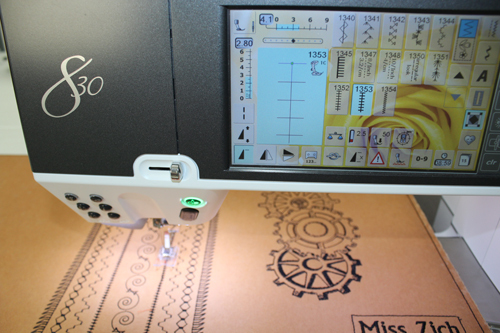 Tip: If your machine has an Endless Embroidery feature, use it when stitching the end-to-end designs. Stitch the spine to the cover pieces with an open stitch that stitches to the right and to the left to join the two pieces. I used stitch #1353. Attach the clear foot to the machine and guide the two pieces straight under the foot, making sure they are butted together. After joining the covers, add three rows of decorative stitches on either side of the cover next to the spine. I used stitches #726, #302, and #634. Topstitch the label in the lower right corner using a triple straight stitch (stitch #6). Sew a line of decorative stitches about 1/2″ from one long edge of each flap piece. I used stitch #1340. 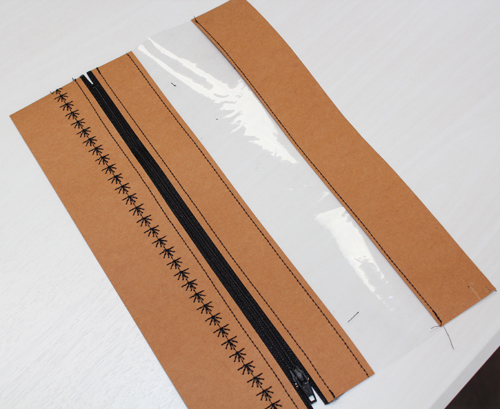 Place a flap inside each end of the folder, wrong sides together, with the decorative stitching toward the spine. Trim edges if necessary. Topstitch around the entire folder the triple straight stitch and non-stitch straight stitch foot, catching both layers (outer cover and flaps) in the stitching. Trim if necessary. Topstitch the zipper between the 1-1/2″- and 2″-wide front strips using a non-stick straight stitch foot and a straight stitch. Topstitch the vinyl and 1-1/2″-wide strip to the zipper section. Change back to the clear all-purpose/zigzag foot and add a line of decorative stitching beside the zipper. I used stitch #699. Place the front wrong sides together with the back. Trim edges if necessary. Change back to the non-stick straight stitch foot, select a triple straight stitch, and topstitch around the edges, catching both layers in the stitching. 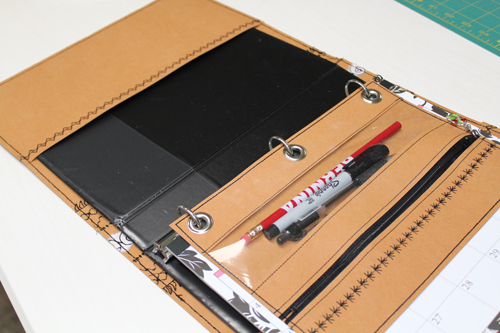 Attach a zipper pull to the zipper and fill the pencil case with newly sharpened pencils. 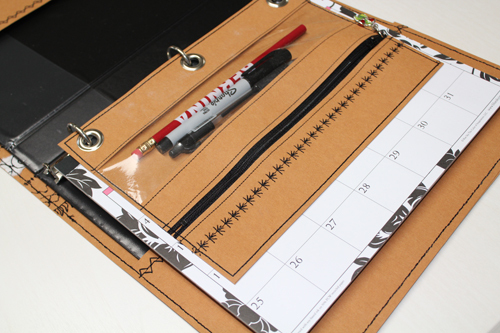 Add a fun calendar and your favorite teacher or student is ready for school!